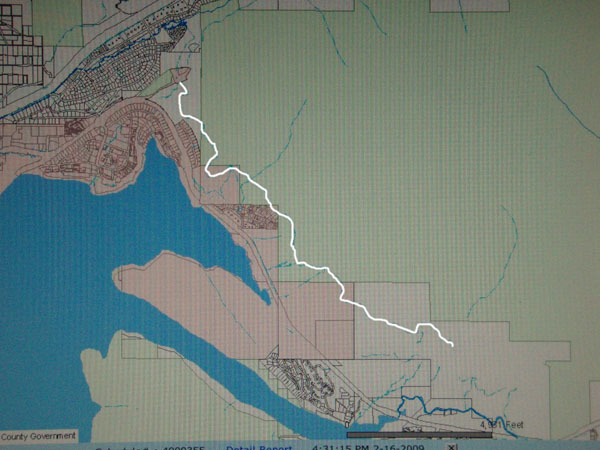 Special to the Daily/Summit CountyThe existing Tenderfoot trail, (shown in white) a four-wheel-drive road across the base of Tenderfoot Mountain, is the battleground over a proposal to create a 36-mile motorized trail. Summit County's delegation to the state legislature have joined several planning groups and nearby residents in opposition to the plan. Summit County’s state lawmakers last week came out strongly against a proposal to expand motorized use on Tenderfoot Mountain in a letter to the state organizations considering the plan. Citing overwhelming local opposition, state Sen. Dan Gibbs and Rep. Christine Scanlan requested denial of a grant application for a project that would add about 36 miles of motorized trails on the hillsides between Dillon and Keystone on national forest land. “We are officially requesting that the Colorado State Trails Committee not approve this grant as part of its 2009-2010 grant cycle,” the legislators wrote. The committee will consider the Tenderfoot proposal starting with public comment at 10:15 a.m. today at the Jefferson County Open Space Foothills Building, 700 Jefferson County Parkway #100 in Golden. At stake is a $479,200 grant from the Colorado State Parks Board, from money generated by motorized vehicle fees. A local group, the Summit County Off-Road Riders, is in the early stages of working with the U.S. Forest Service to develop a plan for the trail system. The off-road group already has landed one state grant to pay for the design of the trail system, but the money hasn’t been used yet. Leaders of the group and Forest Service rangers said they have no plans to move ahead until the White River National Forest finalizes its travel-management plan, a document that spells out use, trail by trail, across the entire forest. According to the Feb. 12 letter from Scanlan and Gibbs to the Colorado State Parks Board and the trails committee, Summit County citizens have raised concerns about proliferation of illegal trails, lack of law enforcement, disruption of wildlife habitat and the displacement of non-motorized users. The Summit County commissioners, the Town of Dillon, the Keystone Citizen’s League, the Snake River planning commission and other community groups all have expressed opposition to the plan. The letter drew an immediate response from Kent McGrew, vice-chairman of the off-road riders’ group, who said he considered the letter to be a broader attack on recreation in Summit County. The group has requested a meeting with Scanlan and Gibbs, both Democrats, to discuss the letter, McGrew said. McGrew said he didn’t know if the request from the lawmakers would quash his group’s hopes for funding. “I don’t think their letter carries any more weight than anyone else’s comment,” he said. Everyone is able to comment on grant proposals as part of a public process, he explained, adding that his group’s plan has received widespread support from motorized users around the state. “The goal of this is to formalize motorized use that has occurred in the area for decades,” McGrew said. Using the grant funding to establish a well-designed motorized trail system would reduce impacts in the area, he added. The motorized users want the same opportunity to use public lands that everyone else has, McGrew said. For the off-road riders, that means a network of at least some single-track trails with technically challenging sections ” just as mountain bikers have. Local Forest Service officials also said the letter from Scanlan and Gibbs wouldn’t be significant factor for the agency at this point. The agency plays a key part because the trail system is proposed mainly for national forest lands. “It doesn’t play a huge role for us, since we haven’t made a decision yet,” said District Ranger Jan Cutts. The agency still is finalizing a travel-management plan for the White River National Forest. That document will determine whether the Tenderfoot proposal even will go forward, she explained. “It would be unfortunate if it takes away other opportunities,” Cutts said. Even if the Tenderfoot project doesn’t go forward, the grant could be used to create opportunities for motorized use elsewhere in the district, she said. The Forest Service is in a tough spot. Local groups and governments have been outspoken in their opposition to the Tenderfoot project, but the agency has to manage forests for multiple use and to provide recreation for the greater American public, owners of the land. “We do have to consider the interests and needs of all the stakeholders,” Cutts said. She admitted that the agency was caught off-guard by the reaction to the proposal. Until the preliminary plan for expanded motorized use in the area became public, the Forest Service hadn’t received any comments complaining about the existing use of the area. “We were blind to it. We thought it would be fairly easy to move forward,” Cutts said. According to Cutts and recreation staff officer Ken Waugh, some of the controversy that has grown around the proposal is based on misinformation ” and that fact that some people made up their minds about the project from the get-go. “Some people just don’t want motorized use, period. Maybe this is the straw that broke the camel’s back,” Cutts said. One of the misconceptions is that motorized users have plenty of other places to do their thing, according to Cutts and Waugh. That just isn’t the case in Summit County, where 80 percent of national forest lands are off-limits to off-road vehicles. They also said public comments and letters to the newspaper about impacts to wildlife and the potential fire danger from off-road use are not completely accurate. Waugh said he’s also seen incorrect references to the status of the Oro Grande Trail as being closed to motorized use, although it’s open. Other people have vastly over-stated the total number of trail miles currently available for motorized use, he said. What’s bothering the rangers most is the suggestion that the agency was trying to push the project through the back door. Cutts and Waugh explained that the travel plan for the forest was developed in a wide-open process with numerous chances for public comment and that any subsequent proposal for a trail system would still be subject to reviews with more chances for citizen input. The options for creating a motorized trail system in other parts of the county are limited, Waugh said. One area that has been mentioned is around Spring Creek, above Green Mountain Reservoir, but Waugh explained that the existing density of roads in that area is already bumping up against a strict forest plan standard that doesn’t leave room for the creation of new trails. The area around Montezuma has also been eyed, but Waugh said the high number of privately owned parcels and concern about wildlife habitat would make it difficult to establish a user-friendly trail system. Plus, much of that area would be above treeline, leading to a new set of environmental impacts.